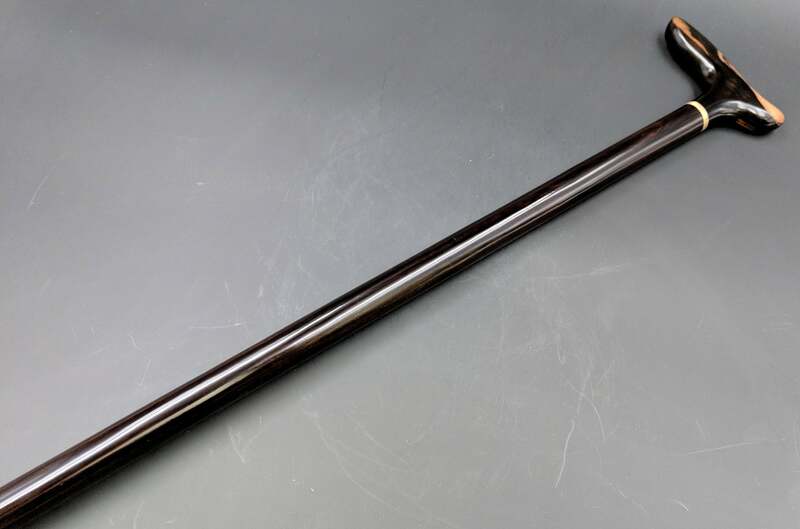 This Ebony Walking Stick Cane is the Top of The Line. 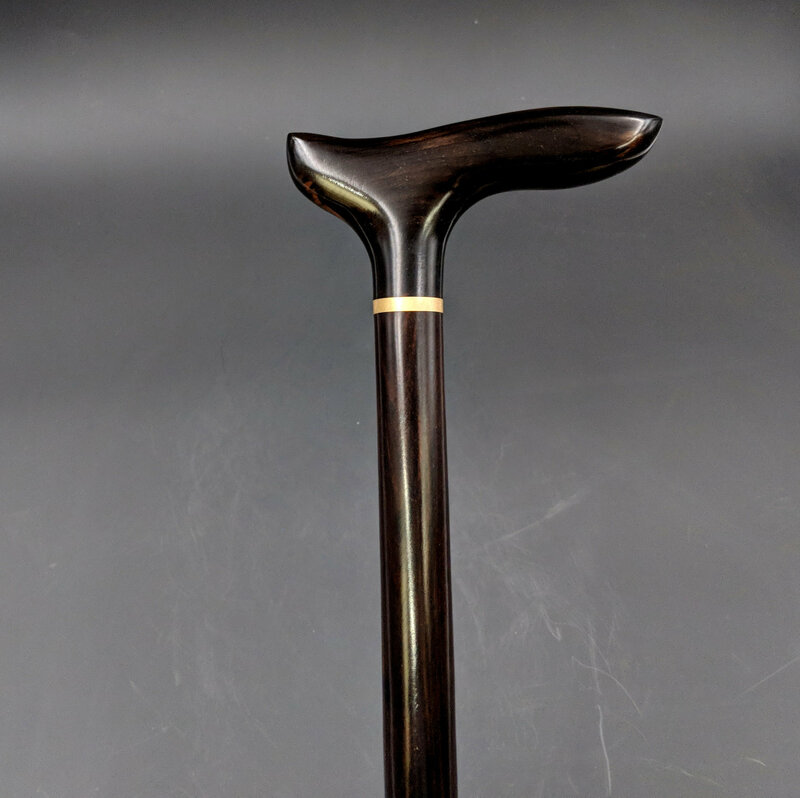 I normally make Koa handled canes with Ebony Shafts because I live in Hawaii and that is what sells in local Retail Outlets and Galleries throughout the Hawaiian islands. This time I decided to make several top of the line Ebony Canes with both Ebony Handles and Ebony Shafts. To offset the grain directional change at the handle connection I used my 3/16 inch thick brass washer that fits over the threaded rod between the handle and the cane shaft. Both the Fritz Style Handle and shaft are made of East Indian Ebony (Diospyros Ebanaster ) . This Ebony is grown in cultured plantations to sustain the resource. The Ebony is mostly a deep black color but it does have streaks of dark brown similar to Macassar Ebony. 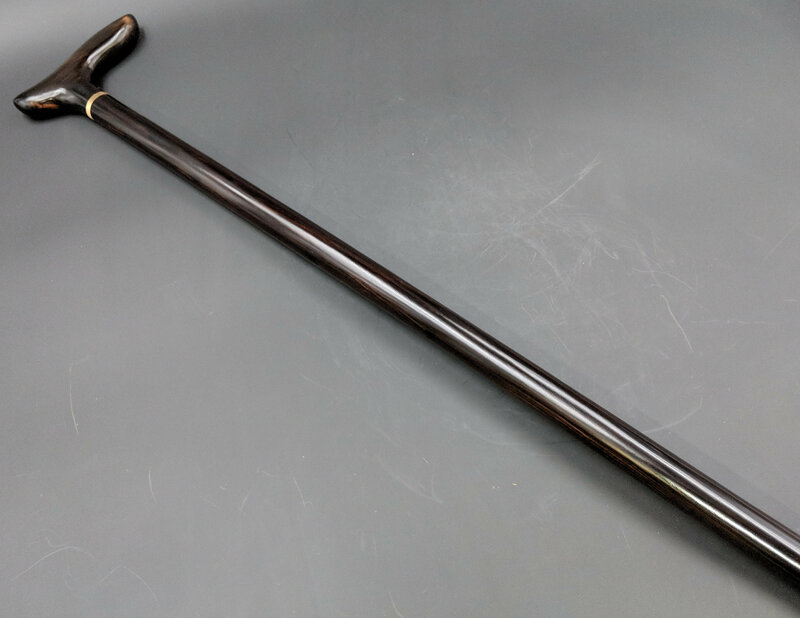 This cane is currently 36 3/8" but can be cut to a shorter length if desired. 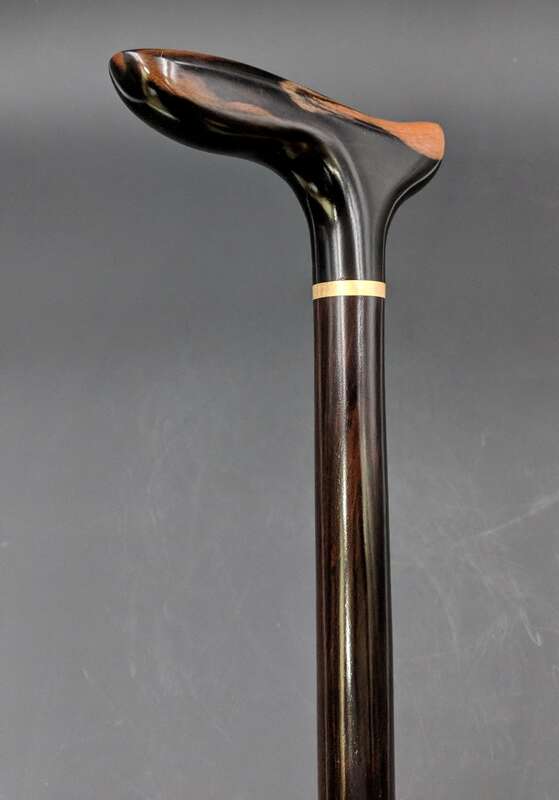 The Ebony shaft is turned into a straight tapered style to give the cane a traditional "Gentleman's Look " . The Fritz Style T Handle is 5 1/4" long and about 1" in diameter and made of Solid Ebony. The connection between the shaft and the handle is very important as extreme stress is put on the joint and is the major point of failure in cane construction. After years of experimenting with different methods of mounting the handles I have decided that the threaded rod connection makes the strongest connection possible. I use a 3/8 x 16 threaded steel rod to connect the two pieces. I first tap the handle hole and the shaft hole to the desired depth and then use epoxy to combine the handle to the shaft with the 3/8 x 16 threaded rod screwed into both the handle and the cane shaft. I also use a 3/16" thick "washer' as a grain directional break which also accentuates the joint. This Solid Brass washer is one inch in diameter and has a 3/8" hole through the center where the threaded rod passes through. I am constantly making and finishing canes and I am sure I have something that you might be interested in. 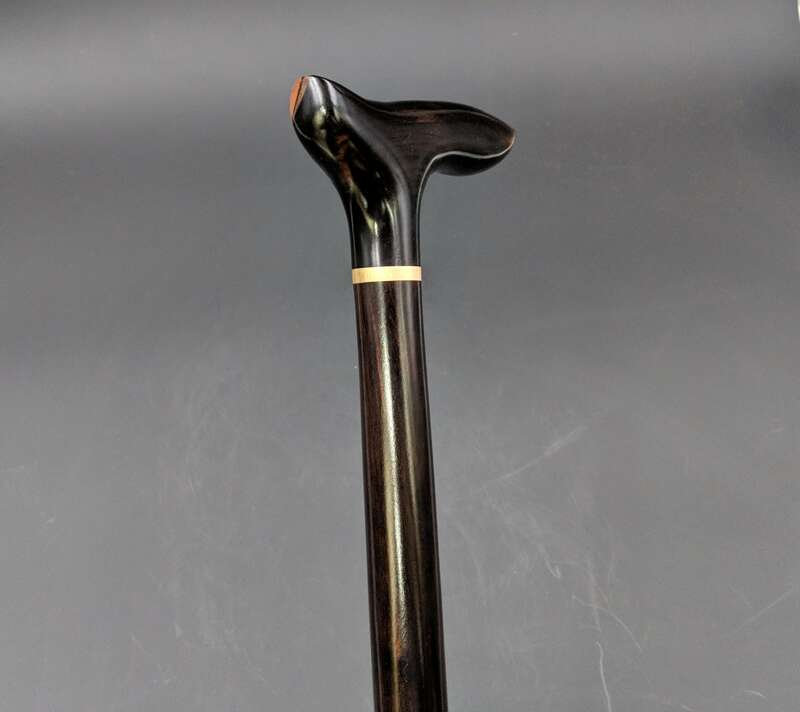 Feel free to ask any questions you might have about this cane or any of the other canes that I have listed here on Etsy. 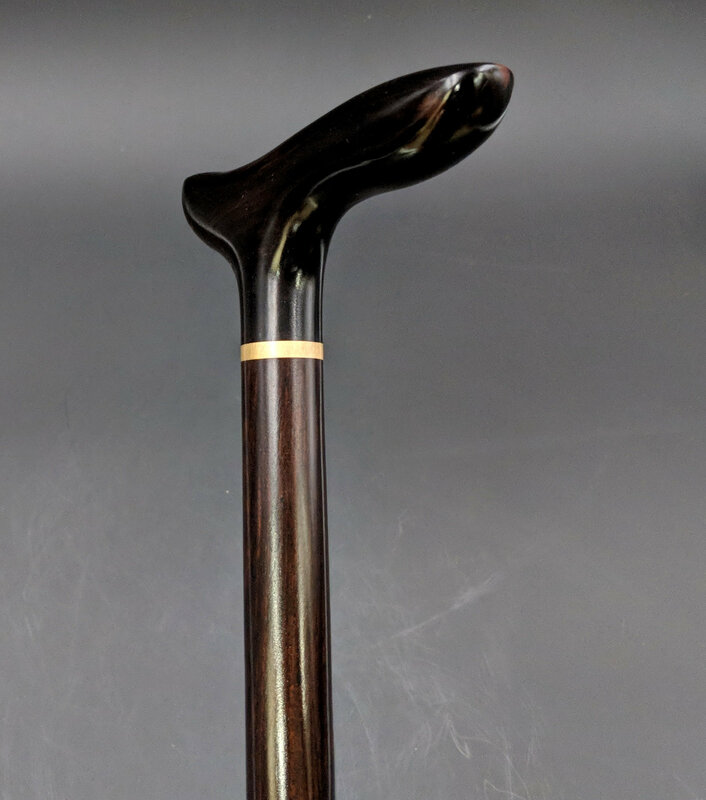 This cane is the epitome of functional elegance. I've always liked the look and feel of ebony canes. The density of the wood produces an almost unique sensation in your hand when the tip contacts the ground during use. But the ebony isn't what makes Jim's canes special. His talent and craftsmanship were immediately obvious as soon as I held this cane. The graceful shape and feel of the handle makes this an "everyday cane" for me. This particular handle is fashioned from a piece of variegated ebony and is as unique as it is eye-pleasing. 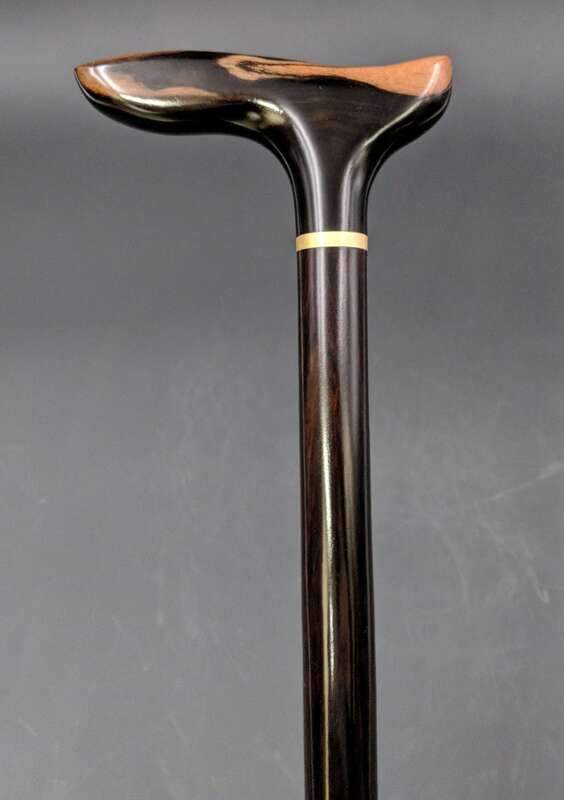 The semigloss finish gives this cane a warm and understated beauty. Finally, Jim is honest, punctual and does what he tells you he's going to do. He undersells and over-delivers. (Thank you for the wrist strap and extra rubber tip.) Simply put, Jim is a gentleman.